Systemic lupus erythematosus (SLE) is an autoimmune disease with a strong genetic component and is characterized by chronic inflammation and the production of anti-nuclear auto-antibodies. In the era of genome-wide association studies (GWASs), elucidating the genetic factors present in SLE has been a very successful endeavor; 28 confirmed disease susceptibility loci have been mapped. In this review, we summarize the current understanding of the genetics of lupus and focus on the strongest associated risk loci found to date (P <1.0 × 10−8). Although these loci account for less than 10% of the genetic heritability and therefore do not account for the bulk of the disease heritability, they do implicate important pathways, which contribute to SLE pathogenesis. Consequently, the main focus of the review is to outline the genetic variants in the known associated loci and then to explore the potential functional consequences of the associated variants. We also highlight the genetic overlap of these loci with other autoimmune diseases, which indicates common pathogenic mechanisms. The importance of developing functional assays will be discussed and each of them will be instrumental in furthering our understanding of these associated variants and loci. Finally, we indicate that performing a larger SLE GWAS and applying a more targeted set of methods, such as the ImmunoChip and next generation sequencing methodology, are important for identifying additional loci and enhancing our understanding of the pathogenesis of SLE. Systemic lupus erythematosus (SLE) is a heterogeneous autoimmune disease characterized by hyperactive T and B cells, auto-antibody production, and immune complex(IC) deposition . SLE has a prevalence of approximately 1 in 2,500 in European populations  and is more frequent in those of non-European ancestry. SLE affects predominantly women (the female-to-male ratio is 9:1) of child-bearing age and is characterized by variable clinical features, including malar rash, glomerulonephritis, arthritis, and neuropsychiatric disease . Although the exact etiology of lupus is not fully understood, a strong genetic link has been identified through the use of association and family studies. The heritability of SLE is approximately 66%; the rates of concordance are 24% to 56% in monozygotic twins and 2% to 4% in dizygotic twins [4, 5]. To date, genome-wide association studies (GWASs) have identified more than 30 associated loci. In Table 1, we show the variants that have reached genome-wide significance (1.0 × 10−8) in one or more GWASs, a metaanalysis, or replication studies. We have also included the Fcγ locus, because it contains multiple associated variants, including a confirmed copy number variation (CNV) in SLE. However, these loci account for less than 10% of the genetic heritability . Odds ratios (ORs) and confidence intervals (CIs) are noted with the primary function of each locus. The genome-wide association studies from which this table was generated were conducted by aHarley and colleagues  (1,846 systemic lupus erythematosus (SLE) women cases and 1,825 controls), bHan and colleagues  (1,047 Han Chinese cases and 1,205 controls), and cKozyrev and colleagues  (279 Swedish SLE cases and 515 controls). The meta-analysis study was conducted by dRamos and colleagues  (939 Caucasian cases and 3,398 controls). The replication studies were conducted by Han and colleagues  (3,152 Han Chinese cases and 7,050 controls), eGateva and colleagues  (1,963 cases and 4,329 controls), and fCunninghame Graham and colleagues  (870 UK SLE cases and 5,551 controls). All loci that have been reported to be associated with other autoimmune diseases - Crohn's disease (CD), celiac disease (CeID), irritable bowel syndrome (IBD), multiple sclerosis (MS), psoriasis (PS), rheumatoid arthritis (RA), type 1 diabetes (T1D), and ulcerative colitis (UC) - are also stated . GWASs in SLE have been useful tools for expanding the genetic understanding of SLE by identifying new loci and replicating previously associated loci. In this review, we categorize these risk loci into a number of pathways on the basis of the current understanding of the potential role for the locus in SLE. We note that the clinical heterogeneity of SLE is mirrored by the diversity of the pathways reported to contain the associated loci from the genetic studies, apoptosis, innate immune response, ubiquitination, and phagocytosis (Table 1). Therefore, this review aims to highlight the known function(s) of the associated loci and to indicate where further functional studies are needed to elucidate the pathogenic mechanisms in lupus. Apoptosis is a well-defined process of programmed cell death and does not immediately release the intracellular content into the extracellular environment [7, 8]. In healthy individuals, dead or dying cells are cleared by macrophages in an inherently anti-inflammatory way. However, in patients with SLE, apoptosis has been reported to be defective and plays a role in disease manifestation . Patients with SLE demonstrate defective clearance of apoptotic cells, which evokes a secondary transition into necrotic cell death . During apoptosis, cells shrink and change morphology by engulfing self-antigens, forming membrane-bound blebs that are exposed on the cell surface. Once engulfed, these blebs carry on their surface intracellular proteins, which can act as a source of auto-antigens, a tendency that is enhanced if clearance is defective [11, 12]. With defective clearance of apoptotic blebs, cells undergo secondary necrosis, releasing nuclear auto-antigens . 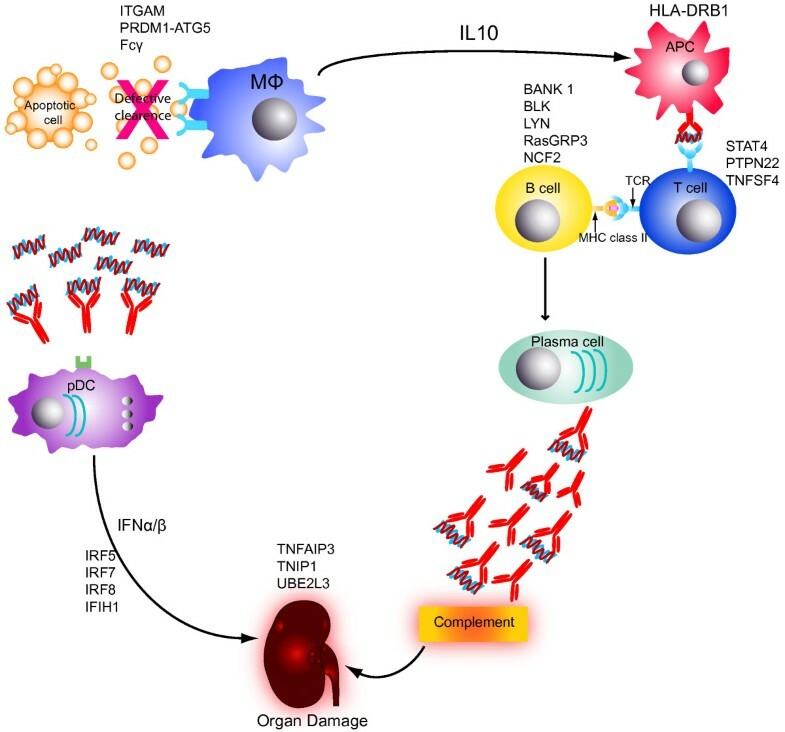 This process triggers the production of inflammatory cytokines and interferon-alpha (IFNα) , promoting lymphocyte loss of self-tolerance, auto-antibody production, and IC deposition. The ICs can bind low-affinity FcγRIIa, expressed on plasmacytoid dendritic cells (pDCs). After endocytosis of the ICs, Toll-like receptor 7/9 (TLR7/9) is activated through the DNA/RNA presented by IC  and this in turn stimulates the production of IFN by pDCs (Figure 1). This production of IFN propagates chronic inflammation and loss of tolerance, both of that patients with SLE have an increased rate of lymphocyte apoptosis , which is possibly due to increased activation of these cells. Mutations in a number of loci associated with SLE have been reported to propagate defective clearance of apoptotic cells and increased apoptosis. The impaired immune system in patients with systemic lupus erythematosus (SLE). Defective apoptotic clearance allows deposition of immune complexes which can stimulate B and T cells. Hyperactive B cells then produce auto-antibodies which activate complement, causing tissue damage. Plasmacytoid dendritic cells (pDCs) activated by immune complexes then release excessive interferon α/β (IFNα/β), again causing tissue damage. At each pathway, the known associated loci are indicated. All of the loci produce loss of both self-tolerance and autoimmunity, as seen in SLE. APC, antigen-presenting cell; BANK1, B-cell scaffold protein with ankyrin repeats 1; BLK, B lymphoid tyrosine kinase; HLA-DRB1, human leukocyte antigen-DRB1; IFIH1, interferon-induced helicase 1; IL10, interleukin-10; IRF, interferon regulatory factor; ITGAM, integrin, alpha M; LYN, V-yes-1 Yamaguchi sarcoma viral-related oncogene homolog; MHC, major histocompatibility complex; Mφ, microphage; NCF2, neutrophil cytosolic factor 2; PRDM1-ATG5, PR domain containing 1, with ZNF domain-autophagy-related 5 homolog; PTPN22, protein tyrosine phosphatase, non-receptor type 22; RasGRP3, RAS guanyl releasing protein 3; STAT4, signal transducer and activator of transcription 4; TCR, T-cell receptor; TNFAIP3, tumor necrosis factor, alpha-induced protein 3; TNFSF4, tumor necrosis factor superfamily, member 4; TNIP1, TNFAIP3- interacting protein 1; UBE2L3, ubiquitin-conjugating enzyme E2L 3. ITGAMencodes the α-chain of αMβ2-intergin (CD11b)  and plays a role in phagocytosis and leukocyte adhesion . GWASs have reported that variants at this locus are associated with SLE, and single-nucleotide polymorphism (SNP) rs9888739 showed the strongest association (P= 1.61 × 10−23, odds ratio (OR) = 1.62). However, a trans-ancestral study in European-Americans and African-Americans  indicated the causal variant as rs1143679, which has been reported to cause two functional changes in ITGAM. The first of these functional changes is an amino acid mutation at R77H (Arg-His) which modifies the tertiary and quaternary structures of the αMβ2 ligand-binding domain . αMβ2-integrin interacts with a number of ligands such as intracellular adhesion molecule 1 (ICAM-1) and the complement C3 degradation product, C3bi; these ligands play a role in leukocyte activation, migration, and phagocytosis . Variants in the αMβ2 ligand-binding domain may alter binding affinity, hence leukocyte trafficking, phagocytosis , and IC clearing . The second functional change is with rs1143679, which impairs the phagocytosis of C3bi-coated particles  and propagates the deficient clearance of ICs and increased inflammation . However, the exact mechanism of how both of these variants influence the pathogenesis of SLE warrants further investigation. The FCGR genes encode diverse Fcγ receptors that recognize the Fc portion of immunoglobulin G (IgG) molecules. Several missense polymorphisms in FCGR2A, FCGR2B, and FCGR3A [21–23] are associated with SLE. Three of the five FCGR genes (FCGR3A, FCGR2C, and FCGR3B) have been reported to show CNV  and expression of Fcγ receptors on the cell surface is dependent on the number of copies expressed [25, 26]. A CNV that resulted in a reduced number of FCGR3B molecules expressed on the cell surface of neutrophils is associated with SLE. The exact mechanism by which the CNV incorporating FCGR3B promotes disease is not fully established, although reduced binding of ICs by neutrophils is a possible mechanism. Ubiquitination is still an incompletely understood biochemical process by which proteins are post-translationally modified through the addition of single ubiquitin molecules or polyubiquitin chains. During ubiquitination, proteins may be tagged for protelolytic degradation by the proteosome. Ubiquitination has also been reported to regulate transcription factors and intracellular kinase activity . Genes that encode these different components of the protein modification system have been reported to be associated with SLE. TNFAIP3 encodes the ubiquitin-editing enzyme A20 [28, 29], which alters ubiquitin patterns, which then alter targeting for proteosome degradation and termination of nuclear factor-kappa-B (NF-κB)-derived pro-inflammatory responses. This occurs through the ubiquitination of IKKγ and phosphorylation of IκBα [30, 31], facilitating the release of NF-κB (Figure 2). A20 is a key regulator of NF-κB through ubiquitin modifications of receptor-interacting protein kinase (RIP) and tumor necrosis factor receptor-associated kinase 6 (TRAF6) .Multiple associations have been found in TNFAIP3 in a range of autoimmune diseases ; of these associations, rs2230926 has shown the strongest significance (P = 1.37×10−17, OR = 1.72) in SLE. This non-synonymous SNP  causes an amino acid change from a Phe-Cys. This amino acid change propagates A20 protein to be less effective at inhibiting tumor necrosis factor (TNF)-induced NF-κB activity . Variants at this locus could potentially lead to reduced inhibitory activity of NF-κB and reduced expression of A20. The role of A20 in the nuclear factor-kappa-B (NF-κB) pathway. A20 ubiquitinates TRAF6, which is bound to the IKK complex (IKKγ, IKKα, and IKKβ). 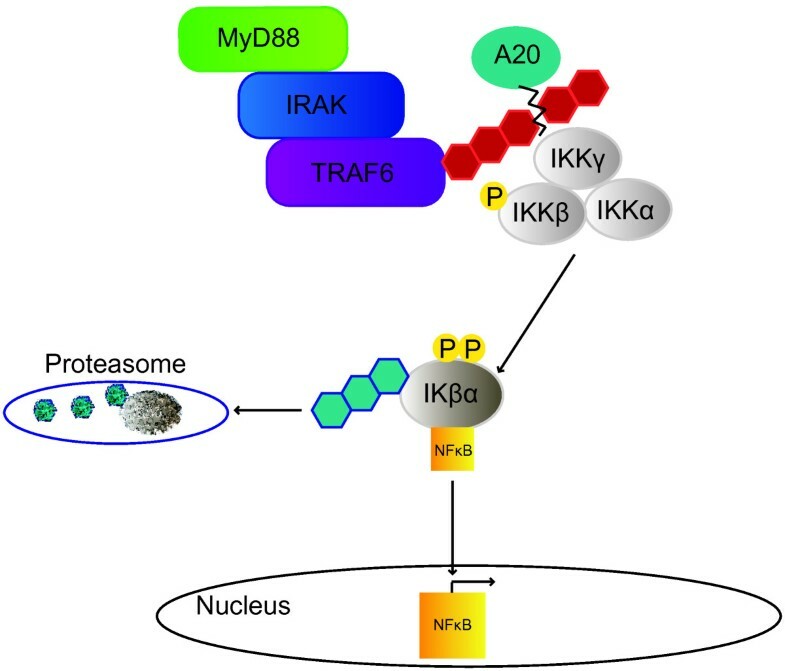 The IKK complex then becomes phosphorylated, propagating proteasomal degradation of IKβα and, in turn, allowing NF-κB translocation to the nucleus and propagating target gene transcription. IKK, IκB kinase; IRAK, interleukin-1 receptor-associated kinase; MyD88, myeloid diff erentiation primary response gene (88); P, phosphate; TRAF6, tumor necrosis factor receptor-associated kinase 6. Owing to increased NF-κB signaling, Tnfaip3−/− mice develop spontaneous inflammation and lymphocyte cell death . This shows the importance of TNFAIP3 in NF-κB regulation through the ubiquitination of adaptors such as RIP . Therefore, it can be seen that TNFAIP3 is an important locus that contributes to SLE pathogenesis through its downregulation. The downregulation of TNFAIP3 facilitates hyperactive NF-κB signaling, chronic inflammation, and reduced apoptosis, all characteristics of SLE. TNIP1, an adaptor protein that binds to A20, has also been reported to be associated with SLE. TNIP1 is expressed on lymphocytes and its expression is inducedby NF-κB . However, overexpression of TNIP1 inhibits NF-κB activation by TNF . Variants in TNIP1 could potentially play a role in negatively regulating the NF-κB pathway . SNP rs7708392 has been reportedto play a role in TNIP1 splicing, rendering the inhibition of the NF-κB pathway less effective. This would propagate pro-inflammatory responses and chronic inflammation. This variant has been shown to be associated with Caucasian and Asian populations . UBE2L3 is a ubiquitin-carrier enzyme gene and is expressed widely on all lymphocytes . It plays a key role in the maturation of transcription factors (for example, p53 and p105, the latter of which is an NF-κB precursor) [40, 41]. This enzyme regulates IFN through TLR7/9 [42, 43]. The exact mechanism of UBE2L3 is still not fully understood, but variants in this locus have been shown to be associated with SLE (rs463426,P = 1.48×10−16, OR = 0.78). SLE is associated with multiple dysfunctions in many lymphocyte subsets. SLE T cells have been reported to show inappropriate tissue homing, increased secretion of pro-inflammatory cytokines , and activation of both dendritic cells (DCs) and B cells . A number of loci have been found to be associated with lymphocyte differentiation and SLE, as described below. ETS1 and IKZF1 are transcription factors that regulate lymphocyte differentiation and lymphocyte development [46, 47]. ETS1 has been reported as a negative regulator of B-cell differentiation and T helper 17 (Th17) cell proliferation . Patients with SLE demonstrate a reduced expression of ETS1, which may contribute to abnormal B-cell differentiation into immunoglobulin-secreting plasma cells and an increased number of Th17 cells [49–51]. While having increased proliferation of Th17 cells causes increased inflammation through the secretion of interleukin-17 (IL-17), ETS1-deficient Th1 cells secrete higher amounts of anti-inflammatory cytokine IL-10 . Interestingly, these ETS1-deficient Th1 cells have reduced secretion of IL-2, which is a potent Th17 inhibitor . The top associated variant at this locus, rs6590330 (P = 1.77×10−25, OR = 1.37), could potentially play a role in decreasing ETS1 expression. Patients with SLE have also been reported to express low IKZF1 levels in peripheral blood . The strongest association found at this locus is rs4917014 (P = 2.75×10−23, OR = 1.23) , which may play a role in downregulating IKZF1 expression. This reduced level of expression contributes to SLE pathogenesis through interactions with other genes; for example, IKZF1 has been reported to play a role in trans-activating STAT4, a confirmed risk locus in SLE . IKZF1 is important for lymphocyte differentiation  and regulation of self-tolerance through B-cell receptor (BCR) signaling . Downregulation of this locus would therefore promote loss of self-tolerance, a hallmark of SLE. Hyperactive B cells play an important role in the pathogenesis of SLE. With the production of auto-antibodies and prolonged cell life, B-cell regulation is important in the maintenance of immune balance. B cells of patients with SLE have been shown to present auto-antigens, induce CD4+ T helper cells (Th1/Th2), inhibit T regulatory cells, and secrete pro-inflammatory cytokines . A number of key loci have been reported to be associated with SLE and are described below. The gene products of BANK1, BLK, and LYN operate in the BCR signaling pathway and have been reported to be associated with SLE , which together attest to the importance of this pathway in disease pathogenesis.rs10516487, located in the BANK1-binding region , has shown the strongest association with SLE (P = 3.1 × 10−10, OR = 1.38). After B-cell activation, BANK1 becomes tyrosine-phosphorylated, resulting in phosphorylation of type 1 inositol-1,2,4-triphosphate(IP(3)R). This phosphorylation event serves to augment calcium mobilization and hence B-cell activation . The associated variant at BANK1 increases its expression by influencing splicing efficiency, creating a splicing enhancer . The expression increase propagatesstronger binding affinity between BANK1 and IP(3)R, resulting in hyper-responsiveness . Cells expressing the risk allele of this variant also have higher protein levels, which can sustain BCR signaling and hyperactive B cells, as shown in SLE . Associated allelic variants in BLK (rs7812879,P = 2.09×10−24, OR = 0.69) and LYN (rs7829819,P = 5.40×10−9, OR = 0.77), in comparison with BANK1, have been shown to decrease their respective expressions [61, 62]. LYN kinase mediates inhibitory signals from CD22, which modulates the B-cell activation threshold . Downregulation of LYN causes hyper-responsiveness of BCR stimulation, triggering autoimmunity  asshown in Lyn−/− mice . Compared with BLK, which affects pre-BCR signaling, active BLK enhances BCR responsiveness . Blk−/− mice have shown no phenotype ; thus, an interaction with BANK1 could potentially explain the association with SLE . As LYN and BLK share similarities of genomic structure , it is believed that, in BCR signaling, BLK plays a role similar to that of LYN. RasGRP3 regulates Ras-ERK signaling, which is crucial in lymphocyte development and activity , and is involved in B-cell proliferation and immunoglobulin production . rs13385731 (P = 1.25 × 10−15, OR = 0.70) at the RasGRP3 locus has been reported to be associated with SLE and may cause an underexpression of RasGRP3, which blocks its inhibitory role in B-cell proliferation. NCF2 is a cytosolic subunit of NADPH oxidase, which is expressed on B cells . It is thought to play a role in the increased production and release of free radicals, propagating B-cell activation. rs10911363 (P = 2.87 × 10−11, OR = 1.18) has been shown to have reached genome-wide significance in SLE  and could play a role in increased NCF2 expression in patients with SLE. Patients with SLE demonstrate an increased number of CD3+CD4−CD8− T cells and Th17 cells and a variable effect on T regulatory cells . These T-cell subsets together lead to increased inflammation, B-cell interaction, and tissue damage . SLE T cells engage the CD3-TCR faster and earlier, leading to increased signaling and intracellular calcium levels. These increased calcium levels may lead to increased expression of CD40L, increasing transcription of cAMP-responsive element modulator (CREM), which would produce hyperactive T cells . However, data on T regulatory cell expression in SLE have been variable. Some reports suggest that T regulatory cells, such as CD4+CD25+ T cells, are deficient in SLE . However, others report enrichment for this cell type [72, 73], perhaps relating toheterogeneity in the definitions of regulatory cells using cell-surface markers. It has also been reported that SLE T cells, compared with control T cells, undergo an increased rate of apoptosis, which again will contribute to SLE pathogenesis. As described below, there are a number of associated loci whose gene products play a key role in T-cell development and TCR signaling and have been reported to be associated with SLE. STAT4 is a Th1 transcription factor that has been reported to mediate Th1 T-cell response, Th1 cytokines, IL-12 and IL-23 [74, 75], and IFNγ signaling [76, 77]. rs7574865 has been reported to have the strongest association with SLE (P = 5.17 × 10−42, OR = 1.51) and has also been described for other autoimmune diseases such as rheumatoid arthritis (RA) , Sjögren's syndrome , inflammatory bowel disease, and type 1 diabetes(T1D) . rs7574865 has been described as being associated with many SLE clinical features, such as lupus nephritis . STAT4 propagates a Th1 T-cell response, increasing IFNγ release . As seen in Figure 1, this influx of IFNγ would target organs such as the kidneys, propagating further IFNγ release and chronic inflammation. rs7574865 may act to increase STAT4 expression and hence IFNγ production. Further reports have shown that other associated variants, such as rs7582694 (intronic), show overexpression of the risk allele (C) in mesenchymal cells but not in B cells . Th is STAT4 risk allele was also reported to be overexpressed in cells carrying the risk haplotype in comparison with cells not carrying this haplotype . PTPN22 encodes the lymphoid tyrosine phosphate protein, LYP, which is involved in the down regulation of T-cell activation through the inter action with cytoplasmic tyrosine kinase (CSK) and suppression of T regulatory cells . rs2476601 (P = 3.4 × 10−12, OR = 1.35) has been reported to be associated with SLE and also with T1D and RA . Furthermore, a trans-ancestral study has shown that rs2476601 is associated with SLE in Europeans, Hispanics, and African-Americans . The associated variant causes the amino acid change of Arg-Try, preventing PTPN22 interaction with CSK [86, 87]. However, the experimental evidence suggests that rs2476601 reduces TCR signaling . Furthermore, PTPN22 expressing the associated risk allele (A) has been reported to bind CSK less effectively than those expressing the G allele, producing hyper-responsive T cells . Therefore, the current experimental evidence does not give us the full understanding of PTPN22 function and warrants further investigation. TNFSF4 is expressed on the surface of antigen-presenting cells (APCs), B cells, and macrophages, and its unique ligand CD123 (OX40) is expressed on activated CD4+ and CD8+ T cells . The strongest association in TNFSF4 is with the upstream variant rs2205960 (P = 2.5 × 10−32, OR = 1.46), and protective and risk haplotypes that carry alternate alleles of rs2205960 have been observed . The risk haplotype has been reported to be associated with increased TNFSF4 transcript levels [91, 92]. This increased expression of OX40L promotes OX40/OX40L interactions and increases the co-stimulatory signal between APCs and T cells, and this in turn increases T-cell survival and thereby propagates autoimmunity. OX40L has been shown in vitro to inhibit the generation of IL-10-producing T regulatory cells needed for tolerance, and it is known that mutations in this pathway cause loss of tolerance and autoimmunity . The major histocompatibility complex (MHC) region has been shown to exert the strongest genetic association and effect in SLE to date; the top association was found atHLA-DRB1 (P = 2.0 × 10−60, OR = 1.98). Studies examining the association with HLA class II have implicated both HLA-DRB1*03:01 and HLA-DRB1*15:01  in SLE. The MHC is composed of 250 genes subdivided into three classes (I, II, and III) with a strong linkage disequilibrium (LD) spanning the region. There appear to be multiple independent signals at the MHC in SLE, accounting for the overall strength of the association seen with the region. One paper reported a 180-kb region of class II, spanning HLA-DRB1, HLA-DQA1, and HLADQB , whereas the second signal was found in a marker of the class III gene SKIV2L. Other immunologically relevant genes such as complement C4A and C4B are also in this region of MHC. The strong LD covering the extended MHC region makes it difficult to identify whether the association arises from the associated variants currently identified or from variants within this LD region. For this reason, further fine mapping of the region is needed and the region may also benefit from trans-ancestral mapping . More than half of patients with SLE show a dysregulation in the expression of genes in the IFN pathway . The type I IFNs are potent cytokines (IFNα and IFNβ) and also mediate the Th1 response, sustain activated T cells, sustain B-cell survival, and lower the B-cell activation threshold . These responses propagate pro-inflammatory cytokines, contributing to chronic inflammation and tissue damage . IFN also acts as a bridging mechanism between the innate and adaptive immune systems. However, it is unclear whether elevated IFN is the causal effect of SLE or whether it further propagates disease intensity. Given the genetic role of IRF5 and a number of other genes in the IFN pathway, it is likely thatIFN exerts a pathway effect in the pathogenesis of disease. IRF5, IRF7, and IRF8 are transcription factors that play a role in type 1 IFN signaling and immune cell development . SNPs in IRF5, IRF7, and IRF8 (P = 5.8 × 10−24, OR = 1.88; P = 3.0 × 10−10, OR = 0.78; and P = 1.24 × 10−8, OR = 1.17, respectively) (as shown in Table 1) have been shown to be associated with increased risk of SLE . These variants have been shown to increase the levels of IRF5, IRF7, and IRF8 transcript and protein expressions . Of these three loci, IRF5 exhibits the largest effect. An IRF5 risk haplotype has been observed and carries multiple mutations, including rs2004640, which has been reported to create a novel splicing variant. Another variant found at the 3' untranslated region, rs10954213, has been reported to create a more functional polyadenlyation site, which creates a more stable transcript . Variants in the IRF5 locus influence alternatively spliced transcripts, which alter or prolong IRF5 expression. Hence, increased expression of IRF5 propagates increased IFNα production. Little is reported for IRF7 and IRF8; therefore, these loci warrant further investigation to determine the functional consequences of the associated variants. IFIH1 is a DEAD box helicase that senses intracellular RNA and induces IFN (type 1) activation . Variants at this locus have been associated with other autoimmune diseases such as T1D , autoimmune thyroid disease , and psoriasis . The top associated SNP in SLE is rs1990760 (P = 1.63 × 10−8, OR = 1.23), which has been shown to increase expression of IFIH1. This increased expression could contribute to an IFN cascade initiated by nucleic acids. TYK2 plays an important role in the pro-inflammatory immune response, being involved in cytokine signaling and the phosphorylation of IFN receptors, triggering a type 1 IFN response . Variants in TYK2 have been reported to increase type 1 IFN gene expression  and deregulate the Th1/Th17 response. Th17 cells are pro-inflammatory, and their differentiation is dependent on IL-6 and transforming growth factor-beta (TGFβ), both of which are cytokines that are regulated by TYK2 . The top associated SNP in SLE, rs280519 (P = 3.88 × 10−8), has been shown to play a role in increasing gene expression and IFN production. Variants propagating increased TYK2 function have also been reported to lead to a pro-inflammatory phenotype with increased levels of Th1/Th17 cells . Multiple variants in TYK2 have been reported to be associated with other autoimmune and inflammatory diseases . From the published GWASs, we are able to identify associated variants for SLE in intergenic regions in addition to those in coding regions of genes. When intergenic loci are identified, it is important to ascertain the functional consequence of the variant on the neighboring genes. Indeed, until a molecular mechanism is fully elucidated, one cannot conclude that any associated allele will primarily exert its pathological effect by influencing the function of the gene that is closest by genomic distance. The PRDM1-ATG5 gene region has shown a significant association with increased risk of SLE at the intergenic variant rs548234 (P = 5.1 × 10−12, OR = 1.25) . This variant has been shown to increase the expression of ATG5 in individuals who are homozygous for the C allele . Since ATG5 is important for the formation of autophagosomes , increased expression of this gene increases autophagy, which in turn stimulates the IFNα and NF-κB pathways  and exacerbates the immune response. However, PRDM1 (BLIMP1) has been reported to play a role in B-cell differentiation , and so variants that affect PRDM1 could allow plasma cell differentiation, which further propagates hyperactive B cells and auto-antibody production. PRDM1 has also been reported to maintain immune tolerance and has been shown to alter DC function in female mice that lack PRDM1 expression on DCs. These mice also develop lupus-like auto-antibodies . Therefore, both ATG5 and PRDM1 could potentially have causal effects for lupus. Consequently, further experiments will be required to establish whether one (or perhaps both) of these genes plays a role in genetic susceptibility to SLE. One trans-ancestral study (Europeans, African-Americans,and Asians) reported two intergenic SNPs between PDHX-CD44 . PDHX plays a role in the pyruvate dehydrogenase complex, and CD44 is an integral cell membrane glycoprotein, which plays a role in cell-cell interactions and regulation of IFNγ and LCK . Variants in CD44 alone have been shown to be associated with SLE . CD4+ and CD8+ T cells of patients withSLE have been shown to overexpress CD44, causing an influx of IFNγ, inflammation, and tissue damage . This fact suggests that the intergenic associations are pointing toward CD44 as a more likely candidate gene for SLE than PDHX. In this review, we describe the key loci that have been associated with SLE to date. We have shown the importance of these genes in their most relevant related pathways (Figure 1). However, to fully understand these associations, fine-mapping studies using targeted genotyping chips, such as the ImmunoChip, will be required. These types of studies will lead to the identification of additional variants that can then be used for functional studies to elucidate the molecular mechanisms operating in lupus. The additional advantage of the ImmunoChip platform is that it allows us to look for a commonality of associations across immune-related diseases. To date, in lupus, there have been a number of relatively small GWASs, which nonetheless have been quite successful in identifying the strongest causal genetic effects in terms of both significance, in which a P value quantifies whether the difference in allele frequency between SLE cases and healthy controls is likely to occur solely by chance, and the effect size, which quantifies the amount of the observed difference between affected and unaffected individuals. However, as previously mentioned, these studies have been able to identify only approximately 10% of the genetic heritability. GWASs in SLE which are much larger than those previously undertaken will be necessary in order to expand the number of SLE-associated loci significantly. To fully explore the genetics of SLE, it is important to study high-risk groups, such as those with African or Amerindian ancestry. This will allow greater understanding of SLE across different ethnicities and will allow fine mapping of the associated loci. Such studies are currently under way. Finally, fbuilding upon these GWASs and replication studies, functional and targeted assays (for example, next-generation sequencing) are needed. These studies enable us to identify rare variants, using methods such asnext-generation sequencing, and to provide greater understanding of the biology of SLE and hence the pathogenesis of this disease. In summary, the genetics of SLE is still not fully understood, but by undertaking additional genetic studies and consequential functional assays we will obtain a much greater understanding of the etiology of the disease.